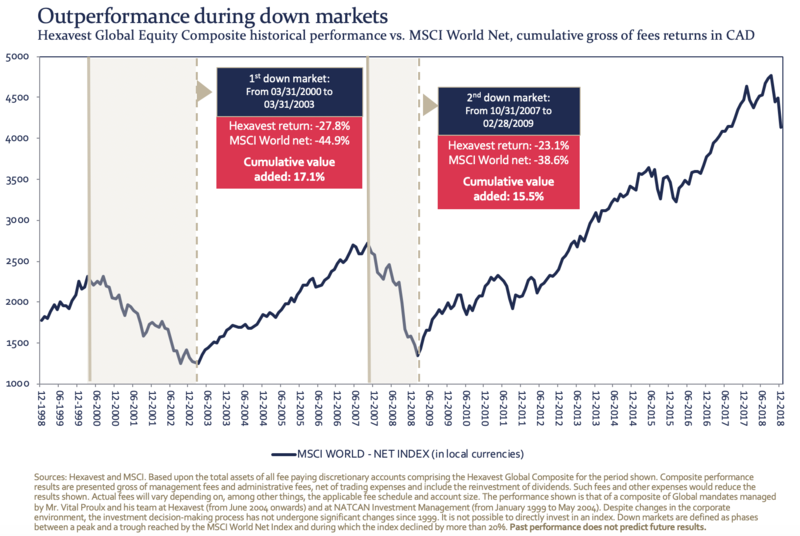 With December 31, 2018 marking the 20th anniversary of the Hexavest Global Equity Composite, please indulge us as we celebrate this milestone (which certainly won’t draw as much attention as the #10YearChallenge recently did on social networks). Scrolling through the eVestment database, which covers over a thousand global equity strategies, we find that less than a hundred sport a track record of 20 years or longer. This longevity demonstrates that our top-down investment process has withstood the test of time through different market phases. In our view, shorter track records make it more difficult to distinguish luck from a sound process. 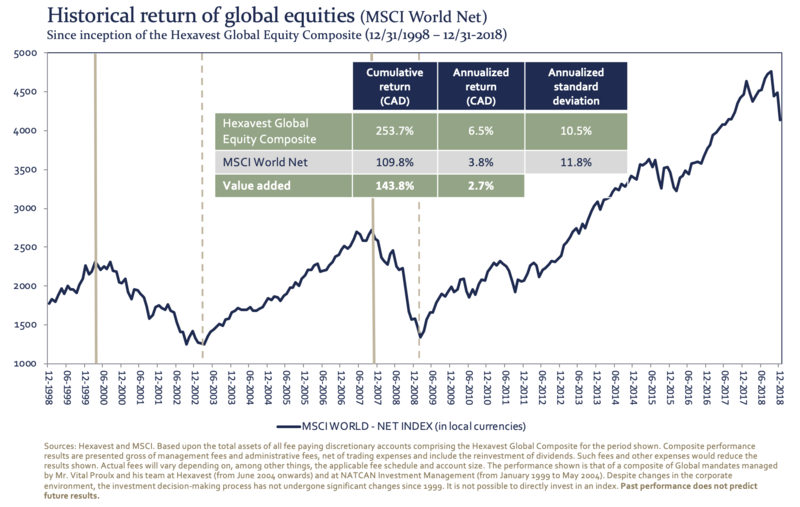 Over the last 20 years, Hexavest’s Global Equity strategy has generally outpaced the MSCI World Index, either on a cumulative or annualized basis. It should also be noted that such outperformance has been achieved with lower volatility than the index. True to our reputation, we have indeed demonstrated successful downside capture in difficult market environments such as the Tech bubble burst from March 2000 to March 2003 and the Financial Crisis from October 2007 to February 2009 (illustrated in the red boxes below). What often gets lost is that we have also generally performed well in up markets, as illustrated in the graph below. For example, take the current bull market. It started in March 2009 and will reach its 10th anniversary in a few months, making it the second longest bull market in history. 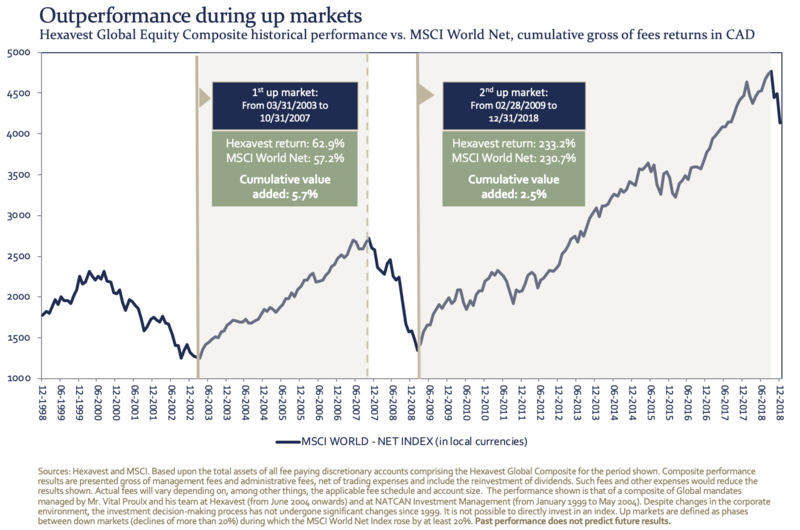 During that period from March 2009 to December 2018, the cumulative return of the MSCI World Net Index hit an impressive 209.0% (in local currencies). In Canadian dollars, the index is up 230.7% while our Global Equity Composite is up 233.2%, hence outpacing the index by a small margin. Although it may be premature to conclude that the downturn observed in Q4 2018 will mark the start of a more prolonged correction (the MSCI World Net Index in CAD returned -8.51% for the quarter), our composite fared fairly well in the fourth quarter of 2018, outperforming the index by 4.74%. As we look ahead, we are very excited about the opportunities we see in the market as well as the potential for our seasoned investment team to continue generating effective risk-adjusted returns for many more years to come. We would like to thank all our clients who have joined us at some point over the last 20 years. We truly appreciate your support. NOTES: This material is presented for informational and illustrative purposes only. This material does not constitute investment advice and should not be viewed as a current or past recommendation or a solicitation of an offer to buy or sell any particular securities or to adopt any investment strategy, or a solicitation of an offer to buy investments and may not be used to make such an offer. The material has been prepared on the basis of publicly available information, internally developed data and other third party sources believed to be reliable. However, no assurances are provided regarding the reliability of such information and Hexavest has not sought to independently verify information taken from public and third party sources. Any investment views and market opinions/analyses expressed constitute judgments as of the dates indicated in this document and are subject to change at any time without notice. Different views may be expressed based on different investment styles, objectives, views or philosophies. Investment results for the Hexavest Global Composite (Composite) are in Canadian dollars and include all fully discretionary accounts contained in the Composite the periods shown. Composite performance results are presented gross of management fees and administrative fees but net of trading expenses. Such fees and other expenses would reduce the results shown. The information shown does not represent the experience that any investor actually attained. A client’s actual holdings, performance and investment experience will be different from that shown. It should not be assumed that any investor will have an investment experience similar to any portfolio returns shown. Past performance does not predict future results. This material may contain statements that are not historical facts, referred to as forward-looking statements. Future results may differ significantly from those stated in forward looking statements, depending on factors such as changes in securities or financial markets or general economic conditions. The views and strategies described may not be suitable for all investors. Investments in foreign securities and markets pose different and possibly greater risk than those customarily associated with domestic securities, including currency fluctuations, foreign taxes and political and economic instability. Not all of Hexavest’s recommendations have been or will be profitable. The returns experienced by a particular client will be different from those included in this document. MSCI indices are net of foreign withholding taxes. MSCI data may not be reproduced or used for any other purpose. MSCI provides no warranties, has not prepared or approved this report, and has no liability hereunder. It is not possible to directly invest in an index. No part of this document may be reproduced or distributed in any manner without the prior written permission of Hexavest Inc.
Past performance does not predict future results. Investing entails risks and there can be no assurance that Hexavest will achieve profits or avoid incurring losses. ©2018 Hexavest inc. All rights reserved. The information provided herein is designed for Canadian institutional investors, consultants, and investment professionals only and is published for informational purposes only. Material and information provided herein is not intended for retail investors and/or distribution to the general public in any jurisdiction. The material is not intended as an offer or solicitation for the purchase or sale of any financial instrument, product or service. The views and opinions expressed are provided for general information purposes only, and do not constitute specific tax, legal, or investment advice to, or recommendations for, any person. The information contained in this website has been compiled with considerable care to ensure its accuracy at the date of publication. However, no representation or warranty, express or implied, is made to its accuracy or completeness. The opinions and estimates published herein represent Hexavest’s opinion and Hexavest reserves the right to make changes or correction to these at any time and without notice. Past performance is not indicative of future results. The information found on this website does not take into account the particular financial situation of the investors which consult it.